When working on any project, there are multiple team members involve in decision making of the task. 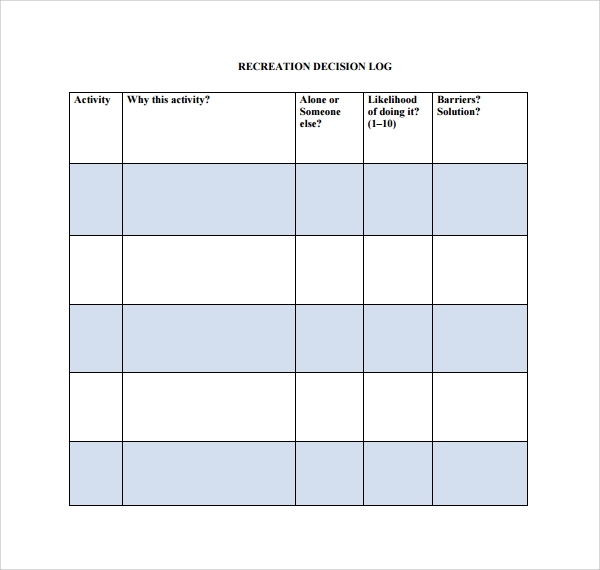 To keep the track of all decisions taken and implemented, a decision log is maintained. 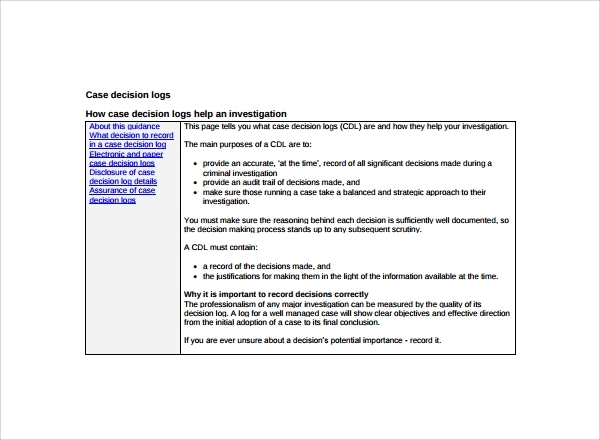 The log has all the details of decision made, implementation of the decisions and addition support if needed. Maintenance Log Template is much better than keeping track on mail. It has all the answers and queries in one place rightly presented. Project managers are the head to make any decision towards the project under them. Decision has to be implemented by the team member. 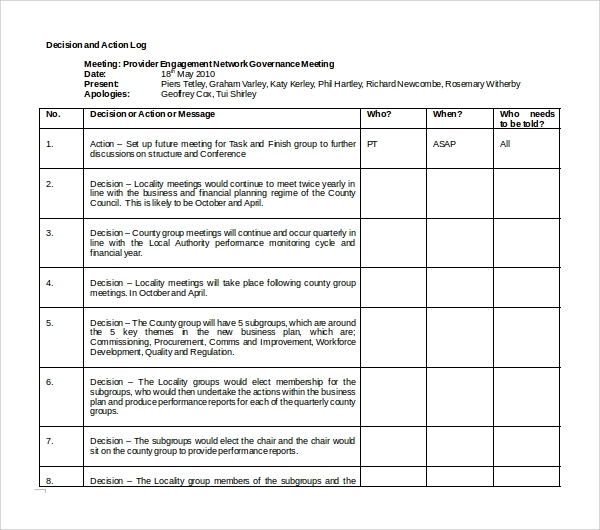 To keep the track of inputs and implementation of the agreed decision, the decision making template for managers is used. After a decision is been taken, action towards the agreed decision has to be taken. The same is well maintained and tracked in this template. The actions are noted in the log so that there is a record of every step towards the completion of the project. 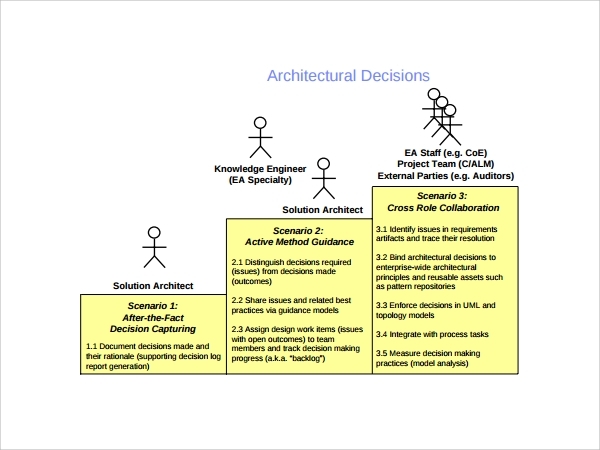 Key decision is type of log that includes all the important and most needed key of the project management. All the things are rightly put up in the log so that in future one can easily understand the key decisions taken during the project working. The log includes all the factors like risk factor, evaluation and resources that have details of all the architecture of the project. The template contains the structural details of how the project is designed and implemented. 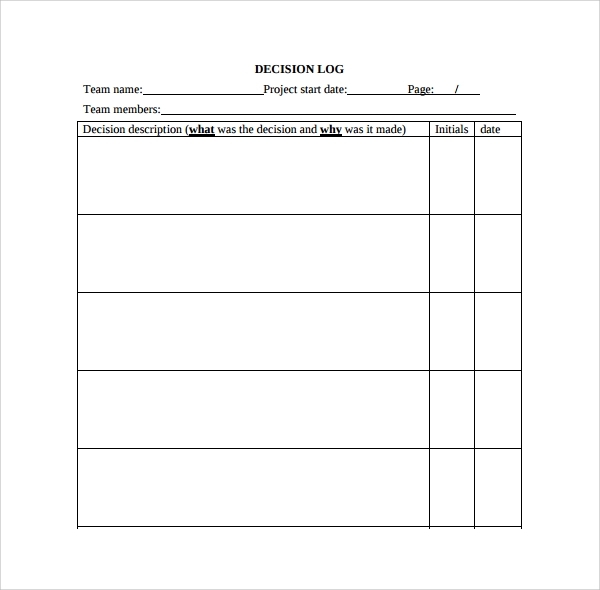 The log helps in maintaining the right details of the project. All the details are well placed and justified in a proper manner. The use of the log can be made to solve project disputes and to solve project strategies. 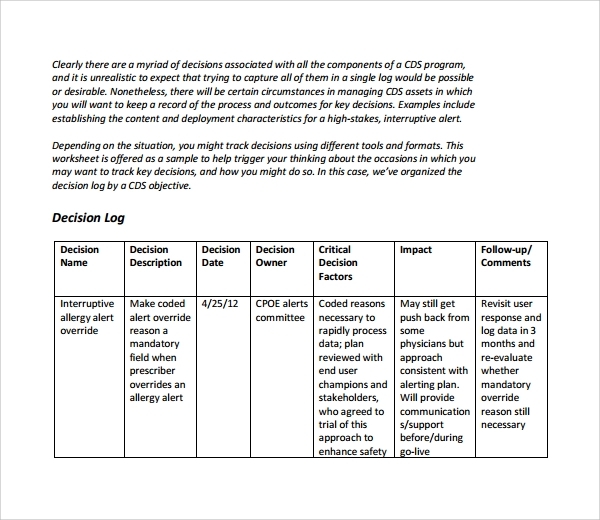 When do I need a Decision Log Template? When any manager of team head makes the decisions, the log helps to keep track of all the project understanding and decision. The details can be reviewed through the log to take up further step in the working of the task. This Travel Log Template has to be maintained for long run projects so that any new member added can have a complete understanding of previous decisions. 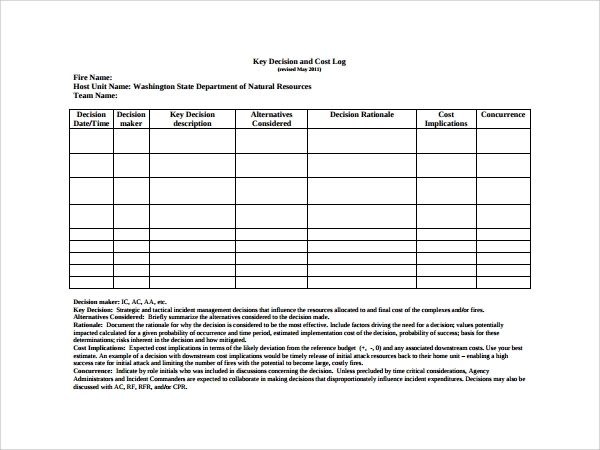 How to Create/Write Decision Log Template? There is a standard format of the log that you must maintain. 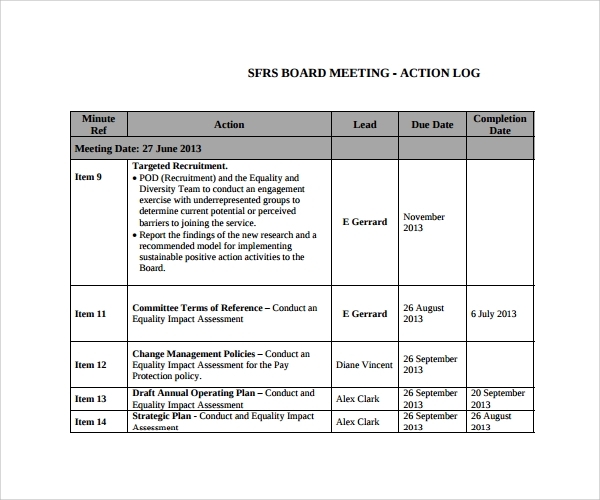 The template has segregation in different sessions that says ref, date, description and agreed by. These columns are filled timely when any decision is been made. The details mentioned have to be very particular and accurate. Timely reviewing of the same is must so that the track is well maintained and recorded. The Password Log Template is circulated among the head team members so that everyone has the knowledge of what is been done previous and also the current status. 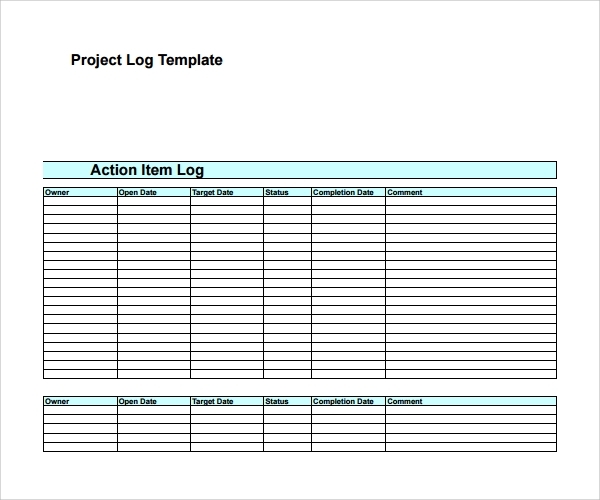 The document of log template is available in word and PDF format. 100% Customizable, one can simply fill in their details and maintain the log. Further the same document can be printed to circulate the hardcopy or also can be sent in a soft copy format.